Digitization has paved way for work from home opportunities, which are beneficial for the job seekers as well as the companies. The companies prefer outsourcing jobs in Philippines to the home workers as their cost to the company is much lower than hiring someone full-time. The job seekers prefer work to from home opportunities as they can enjoy the comfort of their home and earn handsome returns. The work from jobs in Philippines is comparatively stress-free, offer flexible working hours, you stay away from the traffic jams and you have time to pursue your hobbies. The virtual assistants handle administrative tasks. The task can be from marketing, email handling, web support, data entry and other business specific tasks. Social media is a craze, it is a powerful advertising medium and all the companies small scale or large scale require the social media managers to successfully run their social media campaigns. The job openings are plenty. The Philippines is a call centre hub. There are many job openings for call centre agents full-time as well as work from home. All you need is fluency in English, a computer and Internet connection to get started. Some companies provide free online training for the newcomer in the industry thus making it one of the best opportunities for those who want to work from home. Graphic designers also can find good opportunities for working from home. If you are artistic and creative you can make money by designing. Create your own portfolio and jobs will just flood in. Apps are something that governs the technological world today. App or application developers create and test the apps. The app developers need to have problem-solving abilities, analytical skills, knowledge of programming languages, creativity, communication and teamwork skills. The SEO specialist improves the page ranking of the website in the search engines. SEO specialist job profile includes keyword research, content creation, create content and optimisation. Businesses prefer to outsource the content creation to the home-based workers. The job of a content writer is to create and optimize the website content, SEO articles and so on. With new websites getting launched every day, there is a huge demand for content writers. All you require for this job is the ability to express your thoughts and meet the clients’ time deadline. Filipinos are excellent with their English and thus can make a career in teaching. If are good in the English language you can work as an English tutor. There are many online channels where you can apply for this job. A project manager works on the project right from its inception. Everything from planning, executing to staffing, budgeting and delivering is to be taken care of by the project manager. In other words, he is the single point of contact for the project. If you think you can handle the responsibility of working from home, go ahead and apply for the job position. This home based job requires typing and encoding data from one source to another by using a computer. This job doesn’t require any specialised skills just you need to be fast and accurate in your typing with the knowledge of basic computing skills. The digital marketing strategist designs the overall marketing strategy of the company to increase the traffic. For this job you require to have knowledge of SEO, social media, PPC campaigns to name a few. Transcriptionists can earn big by working from home. This online job does not require any formal education. The job of a transcriptionist is to convert a recorded clip into text. With some basic computer knowledge, typing skills and great listening abilities you are ready to be a transcriptionist. Voice artists use their voice to narrate commercials, animated films, movies and more. No formal education is required for this; all you need is a pleasing voice and clear speech. 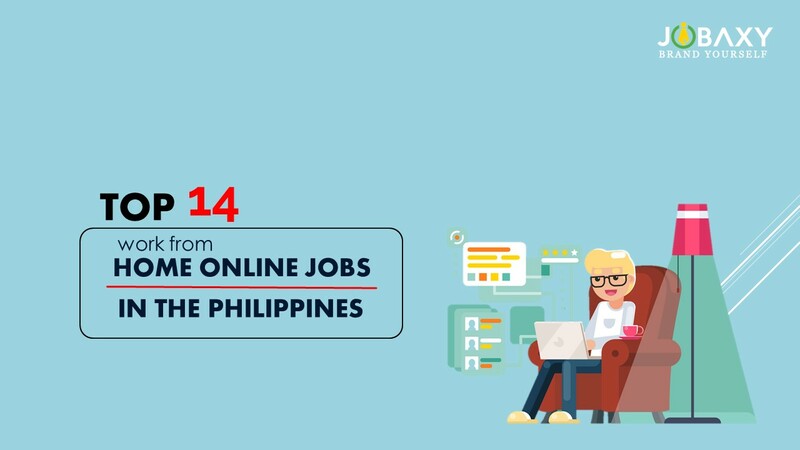 These are the top 14 work from home jobs in the Philippines.